A.A.C. begins its new season of Poetry Jamz at Blackbird Coffee with MistaFunn. Also known as Daryl Funn, he is the Slam Master of the Java Monkey Slam Team and founder of the Misadventures of D-Zine Conceptual Design Firm. 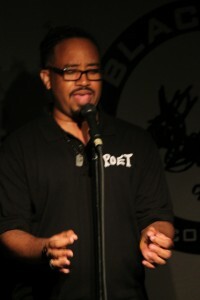 Mistafunn electrified the crowd with a blend of poetry and bold comedy. 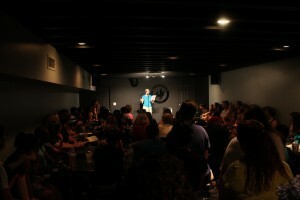 Poetry Jamz is Milledgeville’s longest running open mic series. The event features a new artist each month. Our next Poetry Jamz feature is MC/Poet Harrison Thacker. He is building a movement with new age hip-hop that supports the soul by offering truth and inspiration for life’s journey. You can check out Harrison’s set Wednesday, September 17 at 8pm. Stay tuned for more big events from A.A.C.